The question of whether or not to do storytime themes is not new. Seven years ago Katie posed the question on the ALSC blog and I’ve seen people discuss it on list-serves, Facebook groups, and Twitter since then. The conversation has probably been going on long before then too! This post is not about telling people what to do. I’m not here to declare that themes are a terrible idea, nor am I here to tell you that theme-less is the way to go. I’m here to describe my journey with storytime themes and why I’ve transitioned to prioritizing what I call storytime flow. When I first started as a children’s librarian I did themes for all my weekly storytimes. We have some of them featured here on the blog – check the bottom of our Storytime Resources page. I tried diligently to choose books, songs, rhymes, felt stories, and other extension activities that all fit in the same category. At the time, this helped me focus and search. I know a lot of people who still like themes for this reason – it helps them narrow the possibilities of what to do at storytime. I also liked that I could introduce concept vocabulary around a theme and give caregivers early literacy tips that related specifically to the topic of the day. Themes worked for me in the beginning and I am so grateful to everyone who has blogged about their thematic storytime ideas. I still get asked to do a themed storytime occasionally by a preschool and it’s great to have those blog posts filled with ideas. I’ve been doing storytime for a few years and have built up a knowledge of good storytime books and songs. For my weekly storytimes, I’ve found that themes work less and less for me. Even in the beginning I found them to be limiting sometimes. This happened particularly when I chose a theme and then struggled to find good books that fit the theme. I would sometimes choose a mediocre picture book just because it fit the theme. Doing themed storytimes also meant that I wasn’t doing a lot of repetition in terms of songs and rhymes because I felt like I had to make every song about the theme. This led to less participation from kids and caregivers and was harder on me as I spent so much time trying to memorize new material. Oof. Looking back I wish I had been less strict about the themes and more willing to do what I knew would work best for the group. Unless a preschool or daycare specifically requests a certain theme, nowadays I don’t do them. Instead, I prioritize storytime flow. Storytime flow means that each element of a storytime transitions into the next in a way that makes sense to kids. I try to make a connection between the books and songs which can look like mini-themes throughout a storytime. Storytime flow has a lot to do with transitioning between activities. I spend less time choosing material and more time planning on how I can transition from one topic or activity to another. I think good transitions can help keep your audience engaged and feel like the storytime sticks together in a way that is cohesive. There is no one right way to do this. Here’s an example of a portion of a recent family storytime where the storytime flow worked excellently. Put your hands in the middle and wiggle just so. Put your elbows to the side and quack, quack, quack! Transition: Oh my goodness, are we ducks?! I didn’t know there were little duckies in this room. What sound do duckies make? Quack! Quack! Duckies can do all sorts of things. Let’s look at this book. What are the duckies doing? 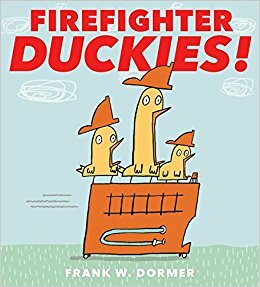 That’s right they are Firefighter Duckies! Transition: Those duckies sure helped a lot of different creatures. I love to help people too. Let’s pretend we’re firefighters just like the duckies. We can go put out a fire! Can you get in your fire truck? We’re going to go really fast, ready? Ding, ding, ding, ding, ding! Transition: We put out the fire, yay! I love to play pretend. Hmm, what else can we pretend to be? (Ask kids for suggestions. If time, act out some of them). How about we pretend to be astronauts? Let’s take a trip to the moon. Okay, everybody rub your hands together; we need to warm up the engines. I put up my felt pieces one at a time when I do this. If you want to take a trip climb aboard my rocket ship. We always do the extra verses too. Transition: What a journey. We went to the moon, and the stars, and the sun! Now we’re going to listen to a story about other things that are in the sky. When you look up in the sky what are some things that you see? Check out Early Literacy Connection for the felt story template. Transition: Caregivers, when you go outside today take a moment and look up at the sky and ask your little one what shapes or animals they see. If there aren’t any clouds out, see if you can spot a bird. You can do this rhyme about birds too that has lots of extra silly verses. I made felt pieces that I use to do the extra silly verses. Transition: Those were some silly birds. Can you see what’s on the cover of this book? That’s right – lots of different types of birds. Cardinals, flamingos, swallows. 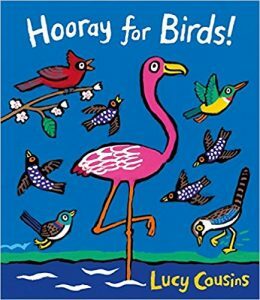 In this book we get to pretend to be a bird and do all the things a bird does. And that’s what storytime flow looks like for me! Do you use storytime themes? How do you make your storytime flow? I’d love to discuss in the comments! Today’s post is a guest post by my friend and colleague Kate Lowe. Kate Lowe works as a children’s librarian in Vancouver, BC. She enjoys testing out new storytime material on her 4 year old son. She is also living proof that anyone can learn to play the ukulele. She’s here to share 9 ways we can encourage pretend play in storytime. We’re taking the research and putting it into practice! Research shows that there are a million and one great reasons to encourage children to engage in pretend play. So how can we encourage the parents, caregivers, babies, toddlers and preschoolers at our library to play “make-believe”? By showing them how it is done and reminding caregivers to try this at home. If you’ve got egg shakers at your library you have everything you need to demonstrate imaginary play. Well, an egg shaker and a willingness to make a fool of yourself in front of a room full of storytime families. Step 5: Cradle it in your hands and treat it like a delicate baby. Proudly show the egg to the audience. 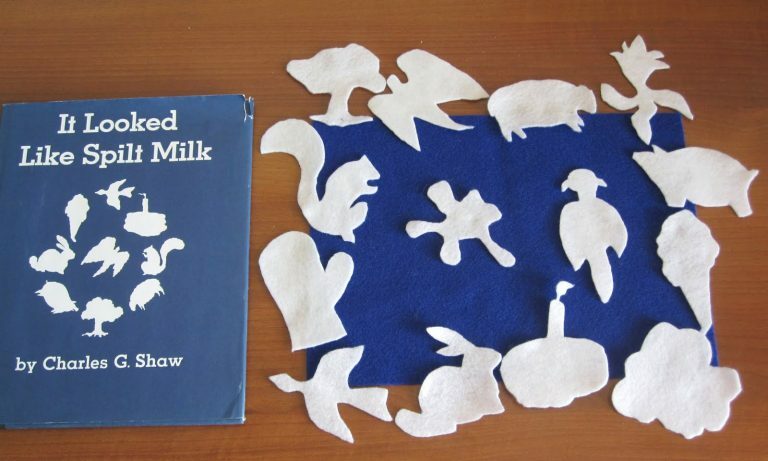 Before starting a felt story take two of the felt pieces and bring them to life with sounds and movement in the air. You only need a few moments of clip clopping the horse along the top of your felt board, or having a cat chase the mouse up your arm to give your audience the idea. You: Let’s give ourselves a round of applause for that song! Best advice I ever got from a puppeteer was: Look at the puppet when you’re have a conversation with it. Look at the audience when you are talking to them. The audience will follow your attention. The song “My Hat it Has Four Corners” demonstrates how a scarf can be a hat or a superhero cape. The rhyme “Here is a Green Leaf” demonstrates how a scarf can be a beautiful flower. Children have a special skill to turn any object into a baby doll. Take a puppet and start to rock and burp it. Pretend for a moment or two that the puppet is your baby to love and care for. A few scarves stuffed inside another scarf then tied with an elastic makes the head and wispy body of a lovely little doll. After a minute of caring for your baby you can tell the audience you are ready to move on to a song or book. Ask the audience to say goodbye to your little friend. If you are finished with the puppet or scarves, carefully place them somewhere safe to keep the illusion going. Library staff are always trying to model how to treat a book gently, but you can take it one step further and pretend the book is a baby, a piece of glass, or precious friend. We can talk to the book, hug the book, and cradle the book. Especially if it is a favourite book that you decide to bring out a number of times during a series of storytimes. The book can become a familiar friend and treated with special care. You could make the book a special sleeping bag, a coat, or give it a special box to sleep in. There are endless possibilities. What storytime objects have sparked your imagination in storytime? Let us know in the comments! What do you do when you’ve got a storytime crowd full of babies, toddlers, preschoolers, and maybe even a few school-age kids too? This, my friends, is the beauty of a mixed-age storytime. At my library we call them Family Storytimes. Family storytimes are great because they allow caregivers with multiple children to bring them all together. We also know younger children learn from older children, and having kids of different ages interact can lead to some beautiful learning moments. But we also know that trying to prepare a developmentally appropriate storytime for such a wide age group is a challenge. Or even just a storytime where everyone is engaged. I’ve been asked to share how I plan my family storytimes and ways to adapt things for a mixed-age group. You can also check out Mixed-Age Storytime Gold by The Neighborhood Librarian. And I overplan. I always have more felts, puppets, and books than I could ever actually cover in 30 minutes. Overplanning allows me to go with the flow of the group and adapt to their needs. For example, if I have an older crowd one week I may be able to sneak in a 2nd book. Conversely, if I’ve got a younger crowd I may need to be up and moving more. I created a new planning sheet that I use for family storytimes. It’s an adapted version of my toddler storytime planning sheet. As always, feel free to edit to suit your needs! 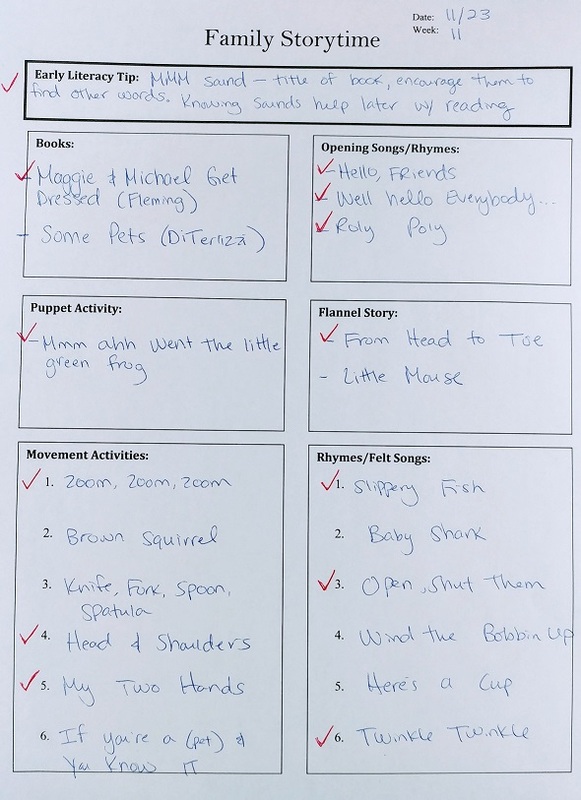 Before storytime, I fill in all the boxes and shoot for about 80% repetition from week to week. I also use felt songs and rhymes A LOT, like almost every song, because it has helped the younger kids and ESL families participate so much more. If I’m doing a prop activity one week such as scarves or shakers, I’ll re-purpose one of the bottom two boxes. Again, I never get through all of this! Here’s a picture of my planning sheet post-storytime with checks next to the items I actually did. Hopefully you can read my chicken scratch! Here are some of my go-to songs and rhymes for this type of group. I’ve included suggestions for how to adapt them to different ages. It’s great to explain the adaptations to caregivers before singing or to model them with a puppet. Great rhythm and the counting is perfect for babies and toddlers. Preschoolers will enjoy coming up with funny rhyming body part combinations. I encourage caregivers of babies to touch their corresponding body parts as we sing. Bounce babies and toddlers while preschoolers row along with you. The extended verses have some fun animal twists that allow for more participation. Many kids will know this one already which will increase participation. Ya’ll know how much I love Zoom, Zoom, Zoom. I highly recommend making these easy felt pieces to go along with it. I tell caregivers they can lift babies and toddlers, while the older kids and I practice our jumping. Lifting songs are great for mixed-age groups for this very reason. If you’ve got a younger crowd, this is a great way to help them get out their energy while also teaching them a fun way to learn to stop. I like this one for it’s adaptability – you can bounce, tickle, jump, clap, etc. Whatever works for your group! This song doubles as an action song and as a diaper changing song! Have the older kids get up and do the motions with you while caregivers with babies can move their arms or legs (if laying down) back and forth. I model how to sing it as a diaper changing song with a puppet beforehand to give caregivers a clear example. Every week I like choosing three children to be our cool cats. Then we insert their name into this song. The older kids will have fun dancing, while younger ones can be bounced and lifted. The ch ch ch ch sound is so great for phonological awareness. I’ll never forget when a 13-month-old made the sound right when we finished the song and we all applauded! I have a set of coloured fish that I put up when we sing this song. Toddlers and preschoolers practice counting on their fingers and making a loud “pop!” sound with their hands, while babies can be lifted into the air at the end of each verse. The simpleness of this song engages the toddlers and allows the preschoolers to sing along with you. I love using scarves with my mixed-age groups. This is my favourite scarf song – watch the older kids throw them into the air or have caregivers make their babies “pop.” Before we sing this one we talk about what colour popcorn everyone is making – it’s hilarious and fun. Another Get the Wiggles Out activity. Toddlers and preschoolers will be able to move around with you while caregivers can wiggle their baby’s thumbs, hands, arms, legs, etc. It’s fun to ask the kids for body part suggestions. You may find yourself wiggling your bum or your armpit. I try to use puppets at least once during my family storytimes. They get the attention of any squirmers better than anything else I’ve tried. I like using this simple rhyme because I can talk about the power of surprise for baby learning. I adapt it by saying, “Little creature in my hand” and then I can use any pop-up puppet or any puppet and a blanket. The older kids like singing the puppet a nursery rhyme like “Twinkle Twinkle” when it’s time for the puppet to go to bed. Practice pointing to different body parts in this body positive song. If we have room I encourage caregivers to lay babies down on their backs when we sing this one so babies can see their smiles as they sing it. Challenge older kids to think of rhyming body parts you can sub in for extra verses. How do you play for a mixed-age storytime? What songs and rhymes do you use? I’d love to hear about your process in the comments. One of the things I’ve been working on with regards to my storytimes is the concept of intention. Being intentional about the books, songs, rhymes, early literacy messages, and flow of those precious 30 minutes. I’ve always been a storytime planner, and I started the year by sharing how I incorporated more repetition of stories throughout a 10 week storytime session. Today I’m sharing my idea about how to intentionally highlight and raise awareness of other aspects of the library during a storytime. Storytime is a wonderful early literacy program we offer at my library. But it’s only one of many different ways we serve children and families. I had the idea recently to start planning out ways I could quickly and easily explain library resources during storytime. I’m treating it like an early literacy tip – directed at the adults, does not take more than a minute to say, and aimed at helping families support their child’s literacy development. As you’ll see below, some of the resources are simply parts of the collection, while others are features of my specific library. The thing about intention is that it makes me sit down and think and plan and organize and list and hopefully, stick to my guns. Here’s what I’m hoping to highlight over the course of my next storytime session and how I plan to say it. I’m thinking about introducing this at the very beginning of storytime after we sing our hello song and saying something like, “The resource of the week today is….” And again, these are meant to be quick and go with the flow of the storytime. Did you know kids can get their own library cards? They can! To get one for your child, come grab one of these blue forms at the end of storytime. The best thing about a child’s card is that they don’t pay late fees. Having their own library card can make a child even more excited to check out books to take home. If you’re ever wondering what to read to your preschooler, we’ve created these booklists with some fantastic suggestions. Our 100 Picture Books to Love booklist features our librarian favourites, while our STEAM for Early Years booklist has information books on topics like science, technology, and math. I’d be more than happy to help you find any of the books on these lists! We sing lots of songs at storytime and if you want to keep singing and dancing at home we have a Music CD collection with lots of great children’s music. They are located right behind us in the blue bins. You can also stream children’s music straight from our website. If you’d like any music suggestions, just let me know! Thank you so much for coming to storytime! To learn more about other programs we have for kids of all ages, check out the Program Information poster board – it’s right back there next to the puppets. Feel free to take a picture of any of the posters, or you can grab one of these brochures to see a full listing. Some of our picture books have special spine labels to help you find things quicker. For example, this book has “ABC” on the spine label because it’s an alphabet book. To find a counting book, look for the spine label that says, “123.” If you’re looking for a specific book, you can always ask a library staff member for help. We have a whole collection of information books about things like nature, pets, dinosaurs, vehicles, and other topics your preschooler might be interested in. These books are all along the back wall. To find ones that are good for preschoolers, look for the word “EASY” on the spine label. Listening to stories out loud provides children with a model of fluent reading which can help them when they get older and are learning to read. They also help preschoolers develop good listening skills which they’ll need when they start school. We have audiobooks which are stories on a CD – they’re right under our Music CDs. Some of them even come with a copy of the book so you can read and listen at the same time. If you have a child between the ages of 0-24 months, we have a separate picture book section called Books for Babies that has great picks for you. On the spine of these picture books it says, “J+Babes” and these books have shorter text and are developmentally appropriate for babies and toddlers. Let me know if you’d like any help finding books for your child. What resources would you point out in your library? How else can we bring intention to our storytimes? I’d love to hear your thoughts in the comments. I’ve been doing storytimes for about three years now. In some ways I still consider myself a storytime newbie. My process for planning is constantly changing and adapting based on articles I’ve read or ideas I see others trying. I’ve written before about how I plan a toddler storytime and how I plan a baby storytime. Recently though I’ve started to think more intentionally about my storytimes in the context of a 9-10 week session. We know repetition is important for learning. And I’ve always made it a point to repeat many of the songs and rhymes we sing each week. But I recently read an article by friend and colleague Tess Prendergast that’s published in the book Library Services from Birth to Five: Delivering the Best Start that got me thinking about repetition of stories. Tess’s article lists repetition of stories as one way storytimes can become more inclusive to families with children with disabilities. I knew this was something I needed to give more thought to. Simply put, I needed to start planning. February 10 Rhyming Dust Bunnies The Bus for Us Jump! March 2 Grumpy Bird The Very Busy Spider Hooray for Hat! In addition to the book, felt, and puppets I also do a selection of songs and rhymes. Little Mouse usually always makes an appearance too. I really like having this kind of overview because I can also plan out my early literacy messages a bit more based on each theme. For example, during Colours and Counting I can talk about using spatial relationship words such as “over,” “under,” “next to,” “above” and “below.” For my Feelings and Emotions unit, I’ll be rereading Mel’s great blog post that includes extension activities and early literacy tips. I feel so much more organized this way! There are so many ways to retell a story; I just happened to choose felt and puppet stories for my first go around. In the future I hope to try draw-and-tells, stick puppets, interactive retellings (like with scarves), or even a dramatic performance. My goal is to do write separate posts about the felt and puppet versions of each story. That way you can see how I adapt and change the story each week, as well as get the kids involved with the retellings. How do you plan out your storytime sessions? Let me know in the comments! It is a common and challenging part of our job and it’s not going away anytime soon: engaging caregivers during storytime. While it got a mention at our Guerrilla Storytime at BCLA 2014 we thought it’s enough of a challenge to warrant its very own post. So here we go, our strategies for welcoming parents and caregivers to storytime and ensuring they stay involved all program long! Allowing time for caregivers to meet and chat before and after the program is one of the most important elements of storytime. It helps families connect to and support each other. It also means that folks (like the kids) get their chatter out before your program begins, which is always a good thing. And then after the program if possible continue to make the storytime space available to families who wish to stay and hang out. Another way to connect with caregivers is by having them introduce their little ones. 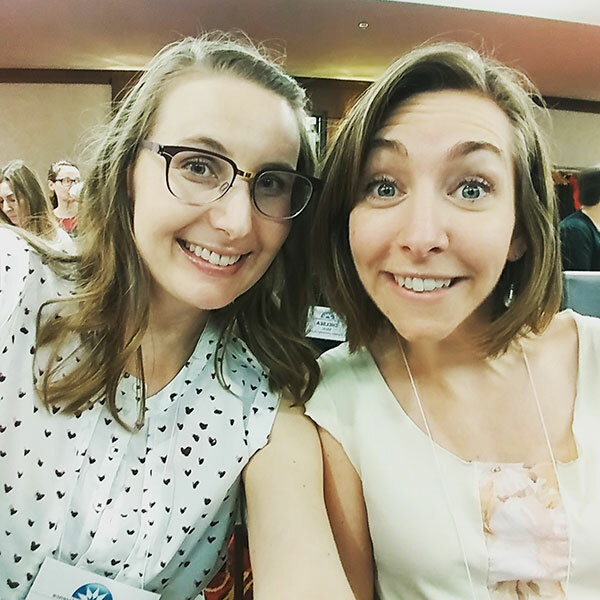 We love this post on Storytime Underground about how and why it’s great to get to know all members of your storytime crowd, big and small! If you have a large group try having people turn to the family closest to them, say hello and introduce themselves before turning back to you. Finally, storytime can be alienating for families who’s first language is not English and it sometimes results in tuning out behaviour from adults. We’ve found that learning a few words, a verse or a song in another language earns major smiles and engagement from parents (and grandparents!) who normally check out. So, we’ve sung their praises before but we cannot say enough about Burnaby Public Library’s Embracing Diversity Project. Check them out for videos of songs and rhymes in 15 different languages! Another method to involve parents is to hand them a scarf, shakey egg or set of rhythm sticks. We’re serious! Manipulatives are a sure fire way to get kids excited and to encourage caregivers to model and help their child participate. While they can invoke a certain level of chaos (we talk about handing out and collecting items in this post) they provide a great opportunity to engage caregivers. For more ideas about using egg shakers, scarves and rhythm sticks feel free to head over to our posts to read more. This may seem super obvious but rather than get frustrated with caregivers when they’re not taking part in storytime invite them in with clear language and reasons. While I love me some passive aggression it’s only fair to give the (reasonable!) adults who bring their little ones to storytime the benefit of the doubt. At the beginning remind them that storytime is a time for them to spend with their children and empower them to be their child’s best teacher. Half way through kindly draw their attention to what you’re doing and say “adults, I’ll need your help with this one!” and at the end thank them for being involved all storytime long. Might take a little practice but with a little asking and a little explaining why we do what we do you’ll have the parents on your side in no time! As I adjust to a new branch and new storytime crowd I am reminded of how tough it can be to not only win caregivers over but to get and keep them singing. These are a few ideas and strategies which are currently working for me and I would love to hear what works at your storytime, please leave ideas and comments below! Overlooked and undervalued, transitions are the secret superhero of any great storytime. Or heck, anytime you’re trying to help kidlets move from one activity to the next! I for one had no idea how important transitions were until I started doing Toddler Storytimes on the regular and now I collect and admire them like gemstones. Think I’m crazy? 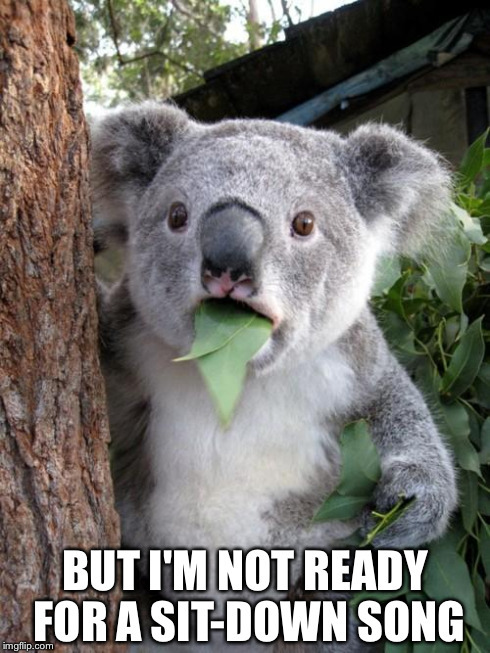 You only need one koala or kid to give you this look before you wise up to the ways of the transition song, rhyme or activity. After a long summer off, I’m back in the storytime saddle! My family storytime just started up and it’s got a great mix of babies, toddlers, and preschoolers. I’ve learned so many new tunes since I last wrote about my favourite storytime songs, so I wanted to put together a list of the ones I’ve been loving lately, especially at the beginning of storytime. For even more hello and goodbye songs, check out our playlist. I’ve broken these ones into age categories, but there are no hard and fast rules about when to use them. Do you have a favourite welcome or hello song for storytime? Let me know in the comments! You can wake up babies’ eyes, ears, hair, nose, etc. I also love adding the verse “Wake up Tummy” and we say “tickle, tickle, tickle” instead of wiggle. I encourage parents to use this song when their baby is waking up in the morning or from a nap. I love this song! I even sing it with toddlers if they are on the younger end. You can get creative with it too – can you pat your head, rub your tummy, touch your toes, etc. It’s a bit of a tongue twister and you definitely have to teach it to caregivers over the course of the storytime session, but once they learn it it’s gold. This song was made for an early literacy tip about phonological awareness. We do this one every week at my family storytime and it’s so exciting when the toddlers start to sign! It’s also got a matching goodbye song. I also use it with my preschoolers. I use this one a lot when I do outreach storytimes because everyone knows the tune already and it’s not intimidating. I’ll also use it with a particularly rambunctious group of toddlers because it gets them up and moving. You can add lots of action verses such as jump up high, shake your hips, touch your toes, etc. I do this one with babies or toddlers as long as it’s a small group. We sing it once for every child, inserting his or her name into the song. The parents really like to hold up their baby or toddler when it’s their turn. A great choice for a smaller, more personalized storytime. There are two ways to freshen up this traditional welcome song. First, try singing it with sign language. Second, try adding this second verse we learned from Katie at Storytime Secrets. Preschoolers are ready for these added challenges. I also use this when I visit Kindergarten and Grade 1 classes and they enjoy it too. There are so many different tunes and lyrics to this song – this is just the one we learned first. If I want to bust out the puppets early on, I’ll sing this song and ask the kids to help me identify the sounds. Preschoolers pretty much know the basic animal sounds so I always throw in a few that make them think, like a dragon or a cricket or a porcupine. We have fun just thinking up different sounds. You can use this one with preschoolers too, but my K-2 kids love it! We talk about opposites and brainstorm some before we sing. It’s more of a rhyme than a song which oddly enough gives it a cool factor that school age kids dig. Again, you can use this with any age, but when I use it with K-2 students I ask them all the languages they know how to say hello in. I like doing this because it gives them a chance to teach me something, and I can model how to be a learner. We usually sing it 2-3 times depending on the languages of the group. I also encourage different actions besides clapping, such as stomping, blinking, shaking, and other silly things like cha chaing.